[ARCHIVED THREAD] - Which 1-4x Scope???? Looking to get a real 1-4x scope(not the cheapo one I have now). I'm leaning towards the Vortex Viper PST, lots of good things said about them, and I've owned 3 other Vortex optics with great success. I'm wondering about the Konus M30, the Leatherwood CMR, and the Bushnell Trophy XLT. Can anyone offer pros/cons? I would get the leupold mark AR. Why? And is that the LEUPOLD Mark AR Duplex 1.5-4x20? Made in the USA, lifetime warranty that you will never need. The vx-2 is a good option too. not the duplex, get the firedot. Mine was missed delivery today (nobody there to sign) but will be here tomorrow! I got a Vortex Razor HD 1-4x this summer and love it. I chose it for the BDC reticle, the tiny dot in the middle of the reticle, and for the illuminated reticle. Pricy, but the best one I've owned by far. 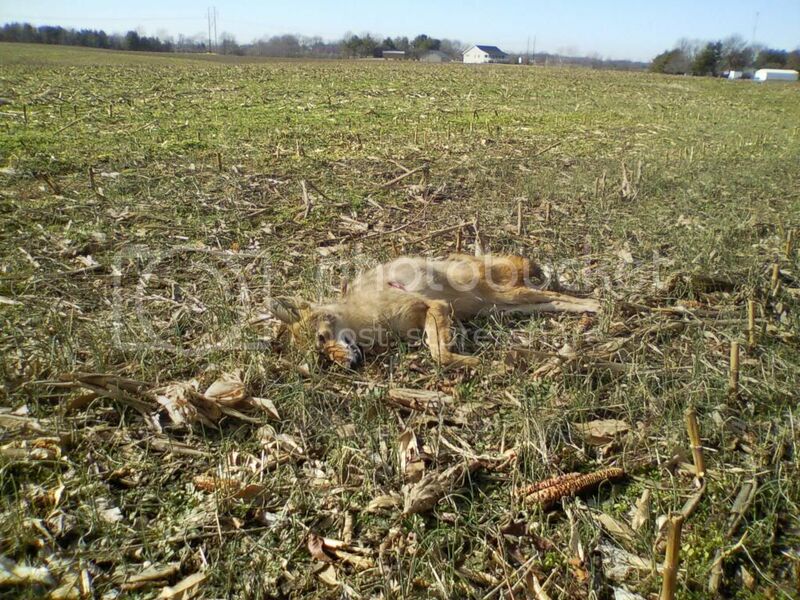 Shot this coyote today at 340. Got her sitting in my sniper den in the second floor window of that shed in the background. I'm trying to keep my budget under 450, and would really like illumination for the reticle. you cannot beat it for the price. I have the Leupold VX-R Patrol 1.25-4 with the red dot. Jury is still out as I have not gotten it sighted in yet. It's well put together and I like the red dot and the motion sensor battery saver. It's my first mil-dot scope and that takes some getting used to. The 1.5-6x42 Bushnell Trophy XLT is illuminated. The dot is real fine. Isn't real bright but the P3 reticule is plenty good for daylight without a bright dot. The 42mm objective lens and 30mm tube make it nice for ID of target in dim light or moonlight. Same idea here, except I went with the Zeiss Conquest Duralyt 1.2-5x36. The 1.2x is close enough to 1x to work for me with both eyes open. The 36mm objective gives a larger exit pupil with the 5x, without the extra weight of a 42mm objective. I love my Burris Tac-30. I really dig my Leatherwood CMR. I did what anyone would do in this situation: I went with the one no one recommended of all my choices, the Bushnell 1-4x Trophy XLT. I'm quite happy with it, the glass is nice and clear, fisheye effect is almost non-existent. The reticle is a 4A, black crosshairs with a single red dot in the center. Even came with Butler creek switch flip-cap. I'm happy with it(for now!). LOL. Good choice for a decent inexpensive scope. I often see it recommended. Congrats! 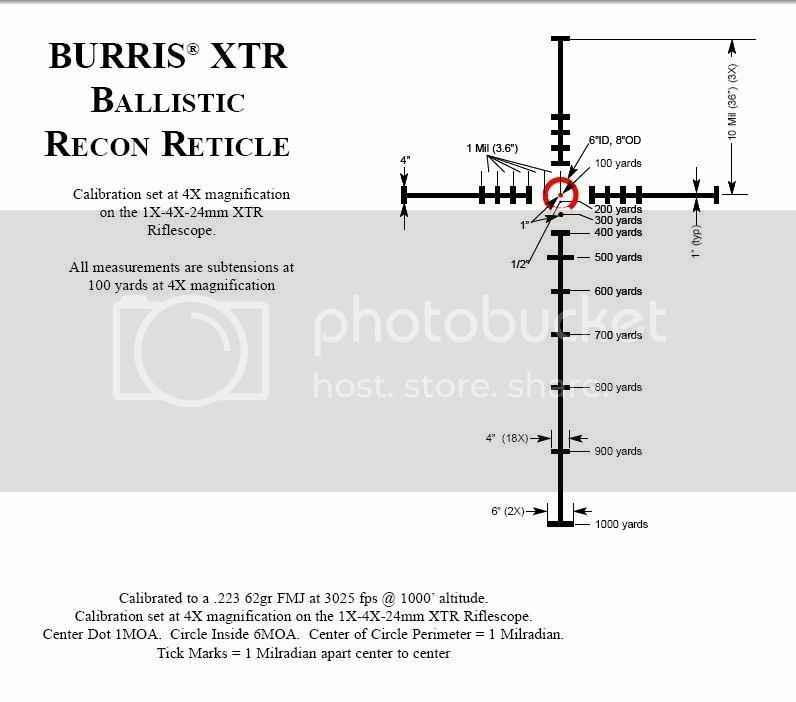 I'm debating on the Vortex PST , Burris XTR myself. I'm still looking and probably wont make a decision till the next gun show to check out both scopes. But I like the reticles but I'm still looking for other options.